« The end of literary culture? “The tradition of buying and giving annuals based on popular comics, characters, TV programmes or even pop stars has become a fixed part of the Christmas calendar in the UK. Most of these will originate with one Scottish publisher, D. C. Thomson of Dundee. 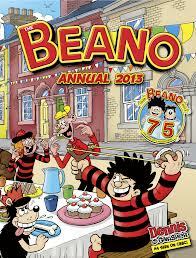 Thomson began publishing comics such as The Beano, The Dandy, Rover, Wizard, Hotspur, Bunty, and Judy in the 1930s. Thomson’s first annuals appeared in 1939. Gifted artists and writers produced a range of memorable characters for these publications such as Desperate Dan, Lord Snooty, and (for Thomson’s newspapers) Oor Wullie and The Broons. Oor Wullie was voted the top Scottish icon in 2004 – ahead of Sean Connery and William Wallace! While comics went into decline from the 1980s, the annuals have prospered for longer. Some continued to appear even after the disappearance of the comic itself. The most popular annuals are now those based on Oor Wullie and The Broons, tapping into both the extensive readership of the weekly Sunday Post and the market for nostalgic reminders of childhood. Here’s a link to the National Library of Scotland’s site where Oor Wullie (Our William to those of you who aren’t up to speed yet) will teach you Scots.